This board clearly was not happy conforming to the path the fence-maker intended. So it went its own way. 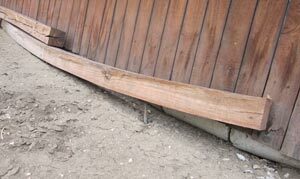 Depending on how particular the fence owners are, it may not last in that role very long. As someone works for you, it’s good to recognize their natural bends. Both you and they will be happier as a result. If you, as their boss, can let that co-worker’s bends work for you, you will both succeed. The same exact principle applies to parenting. But in both cases, it’s an art to find those bends. Clever Paul. A nice reminder for me to appreciate differences & people’s nuance’s (including mine) . I am a supervisor / boss & I will remind myself of your analogy from time to time. It may keep me sane when all around me is insane! I love it. But consider this as well: It could depend on how we look at the board. It may seem flawed or warped, therefore it’s not covering the exposed area. But to me it looks like it’s doing the job of two boards. It’s not only doing its own job by supporting the board behind it, but it’s reaching up to keep the slats from coming loose and falling ,,. Sharron: Glad it was helpful. James: I forgot that angle! Next PostNext With the herd?